Cosplay in America is a coffee table book filled with spectacular full color photographs of cosplayers from anime conventions in the United States. The photographer and mastermind behind the book is Ejen Chuang. Chuang photographed approximately 1,651 cosplayers over a five month period in 2009 in order to gather the images for the book. The final product features 272 pages with 260 cosplayers. The photos were taken at Anime Expo, Otakon, Fanime, A-Kon, AnimeFest, and Anime Weekend Atlanta. The book retails for $40, and it is only available online at cosplayinamerica.com or at various convention artist alley tables. 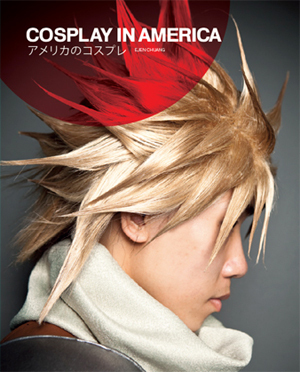 However, The Convention Fans Blog has been given a copy of Cosplay in America, which has been signed by Ejen Chuang, to give away to one lucky reader! 2. If you don’t have Twitter, leave a comment on this post with your name and e-mail address. Comments will remain hidden, so you don’t need to worry about your e-mail address being displayed for all to see. 1. You may only enter once and via one method (i.e., don’t tweet the message and leave a comment). 2. All entries must be received by midnight (EST) on Thursday, August 26, 2010. 3. Only the winner will be contacted. Once contacted, the winner must provide a mailing address within 48 hours, or we select another winner. 4. You must have a mailing address within the United States or Canada to win (sorry!). Questions? Feel free to post a comment. Good luck to all of those who have entered thus far! As a reminder, all comments will remain HIDDEN so do not be alarmed if your comment does not show up on this post, it’s not supposed to.